With the cold season fast approaching, the farmer’s market in my area didnt have much variety of vegetables to look for. I did manage to spot a few Ridge Gourd’s and gladly got them home. And with Peas, green chilli and coconut put together, it made a delicious curry and I like to call it as Ridge Gourd and Pea's Curry. Simple, eh?! 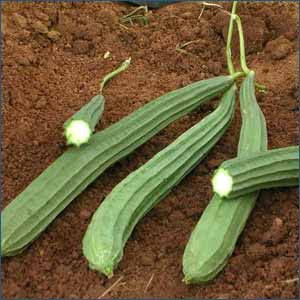 Ridge Gourd is also known as the silk gourd or luffa. In Kannada, it’s called Heere Kaayi. Wash and peel the gourd. Chop them to small cubes. Heat a cooking pan with about 2 spoons of oil. Add the tempering and when done, add in onions. Sauté for about 2-3 mins or until the onions get tender. Add cubed ridge gourd and peas. Sauté for another minute. Pour in little water, just enough to cook the gourd. Cover it with lid. In the meanwhile prepare the coconut paste: In a blender, add grated coconut, green Chillies and poppy seeds. Grind them to a paste. Check if the vegetables are cooked. If yes, take about a big spoonful of the vegetables and blend them together with the coconut paste. Mix in the coconut paste to the vegetables in the cooking pan. Add salt and check for taste. If the curry is too thick, add little milk to attain desired consistency. Cook for another minute and turn off the heat. Serve this hot hot curry with Chapatti’s or Roti's. This can also be eaten along with rice. Happy Dasara, enjoy the weekend. looks delicious nanu sumaru hege madthini swalpa tomato kuuda hakthini :) chapati jothege sakathagi iratte alva! I like this vegetable Ridge Gourd very much. We make a kind of curry with potato & other ingrdients & serve it with rice. I will definitely try your recipe which looks very tempting! Thats a new method for me to do with ridge gourd,grihini...Thanx for the recipe...!! Thank you all for your comment n feedback. ~ Asha: Hope you had a good dassara. I too make chutney with this. Will share my version of this recipe soon. ~ Sirisha: Try this version n let me know how it turns out. ~ Roopa: Hmm..sakkath aagi iruthe idu. Will try it with tomato next time. ~ Kitchen Scientist: Dal sounds a good combo with this gourd. Gotta try the next time. Mansi: Welcome to my blog world. I hope u come often :) Will surely try n participate in Peach event. Lemme check the details..
Raks: Ur welcome. Please try this n let me know if you like it. umm..mom used to make that but with some variations. My MIL's cooking is totally diff :( I get to eat all these when I go home :). Loved this curry.